Rear end collisions comprise one the most common causes of all car accidents. A 2015 Washington Post article reported that there are approximately 1.7 million rear end car accidents in the United States each year. In those collisions, approximately 1,700 people die and another 500,000 suffer injuries. This is likely a result of the fact that many drivers are not anticipating a sudden stop from the vehicle ahead of them while they are driving and far too often, neither driver has their full attention on the road. Regardless of the reason for the collision, it is important to understand the potential impact of the collision and factors a court will consider in determining negligence of the drivers. 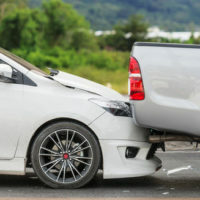 Unlike some head-on collisions, injuries resulting from rear-end accidents at times will manifest themselves a few days after the collision occurs. A few of the most comment injuries from rear end accidents are: Cervical spinal injuries: In the United States, the majority of all neck injuries treated by medical professionals are as a result of rear-end car accidents. Often these injuries are due to damage to the ligaments in your neck, which are relatively weak and susceptible to injury. Injuries caused by airbags: Although airbags can avoid more serious injuries, they often still cause bruising, broken noses or ribs, and damage to your vision. Hip fractures: You may notice that at times, when you pull your seatbelt too fast, it locks into place. This is the same thing that happens when you are jolted forward in a rear end accident. As a result of the seatbelt locking into place around your waist, you may suffer from hip fractures. Whiplash: A unique aspect of rear end accidents is that often the victim will not have any opportunity to anticipate or react to the impending injury since it is occurring behind them. As a result, their head stays in place while the rest of their body is thrust forward due to the impact of the accident. Death: Unfortunately, in some circumstances, drivers in a rear end accident may die. Prior to 2012, Florida courts applied a presumption that the second driver was negligent in rear end accidents. However, in the 2012 case of Cevallos v. Rideout, et al., 107 So. 3d 348 (2012), the Florida Supreme Court reversed the Fourth District Court of Appeal and presented an opportunity for the second driver to rebut the presumption of negligence. The Cevallos case involved a three car crash in which the middle driver was purportedly talking on her cell phone and as a result, came to a sudden halt prior to crashing into the car in front of her. Because of the middle driver’s negligence, the third driver argued he was unable to stop and became part of the collision. If you are rear ended in a car accident, you should hire an experienced personal injury lawyer to evaluate your claim and resulting injuries. The skilled West Palm Beach lawyers at Lesser, Lesser, Landy & Smith, PLLC can help go through the facts of your collision and determine the best strategy for moving forward. Contact us today for a free consultation.